Taking advantage of the unique characteristic of overgraze enamel red (that it does not easily bleed over) this style paints detailed fine figures on the entire surface called saibyo. The detailed figures drawn in red patterns with gold ornaments are also common among Akae. 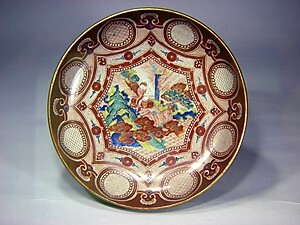 Subjects painted in gold over red base are specially called “Kinrante” among Akae ware. The attraction of the style are fine detailed figure with saibyo requiring highly skilled techniques and the brilliant collaboration of gold ornaments and the color of the picture.